First, we set up a plan on how we want our theme to look then we went ahead and created the style.css, this week I realized that it would take forever to get through this and decided to offer up the theme in it’s entirety as well as some code tidbits and such! Both the sidebar and footer are widgetized. The footer is 3-column so I suggest using only 3 widgets in that area. I want to know how to make my own personalized headings for everything in the sidebar! I use a pre-made wordpress theme. 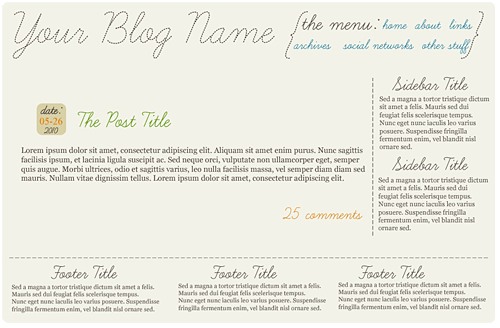 but i want to add a widget area.. at header and/or footer. no idea how! Again, if you have any errors, questions, etc, just let me know! Hopefully everyone enjoys the theme or at the very least learns something from it (by going over all the files and such) and the wee code bits! Another great post and it’s wonderful that you’ve zipped it up for us to play with and use. A great little series. Are you still planning to go through the individual pages? Not a problem if you’re not but you do explain things in a simple no fuss way. Once again thanks. I was going to go through all the pages but 1. due to lack of questions 2. the inability to break EVERY LINE DOWN really wore on me. Hopefully just by EXPLORING the theme and even comparing it to OTHER themes out there, people can see how easy it CAN be! I quite like the idea of actually having stuff in your footer. However, I do worry that it is just going to be overlooked as people may not scroll down that far. Personally, I only scrolled down as far as your footer to see if your current layout was the same as the one you are giving away. Generally my posts aren’t so long so the footer is MUCH more visible, I do think not all designs should have a footer with a lot of content if they have more than 5 posts on the main page. I like the format! I always heard that WordPress was hard to navigate– you make it seem easy! Aww thank you! WordPress IS EASY, it’s just a matter of breaking it down to it’s basic form to learn it! Great stuff, Sarah! Have you thought of making WordPress themes to sell? Have you heard of Theme Forest? Not sure if you’re interested, but I’m sure you could make a very nice supplemental income by distributing WordPress themes! Thank you so much! I’m not sure if I would do well selling themes, as it is, I am wondering if THIS theme that I’ve offered up is even functional for people lol. I guess I would have to see it in action for a few months lol. Great job Sarah! You are seriously just all kinds of awesome. I love the theme. Well done! Hope all’s well with you and the family. I keep missing you on Twitter. One of these days will be on at the same time again. Have a great day. Thank you! I’ve not been twitter active lately, blame the weather and AF lol. What a fun and nice theme. I wish I would have found a free theme! Oh wow. very nifty theme :D I love it!! I’m attempting to use the cufon plugin with a new font to change the sidebar titles in a Thesis template with no luck. I am unable to open the newly created font.js font file to verify that I have the correct name of the font file and can’t seem to get it to work. Any suggestions or tricks with Thesis 1.8? There is nothing specific that needs to be done to have Cufon work with Thesis. I would suggest recreating the cufon font file, making a note of the name you give it. Then in the WP Dashboard – > Appearance -> WP-Cufon, following the directions. ALSO you need to make sure you are using the correct CLASS NAME so that Cufon knows WHAT to change. Hey, how do you add a new folder in order to upload the fonts? I can’t figure it out. You do it via FTP or your CPanel (control panel for your hosting account) file manager.